A showdown between good and evil, the Sanctum and the Demesne, is inevitable when the brutal leader of the Demesne escapes confinement and sets up a hidden lair in the quiet town of Saint Rushton. 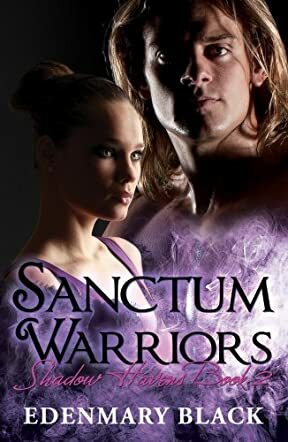 Sanctum Warriors: Shadow Havens Book 2 by Edenmary Black follows the efforts of the Sanctum leaders and the wife of Sebastien, the rogue head of the Demesne, to control the bloodshed and terror now unleashed outside of the secure havens. Matters are brought to a crisis point when Sebastien’s warrior kidnaps a Sanctum human for his personal feeding needs. Ilea, Sebastien’s wife and new leader of the Demesne, receives unexpected assistance from the spirit of her dead son, Saan, who is able to inform her of his father’s location. Through the marriage of Ilea’s daughter to the son of the leaders of the Sanctum, the havens are now able to work together to try to stop the violence and bring Sebastien to supernatural justice. In Sanctum Warriors, Edenmary Black creates a great stand-alone story that is also a perfect continuation of Sanctum Angels: Shadow Havens Book 1. The characters are well developed and the action is compelling as they work together to prevent the human world from being taken over and destroyed by the old-fashioned beliefs of a rogue leader. Individually and within their designated roles in their respective havens, each character stirs the emotions and pulls the reader deeper into the plot. The Sanctum warriors face adversity with courage and the love of their fellow members in the hope that good will prevail.